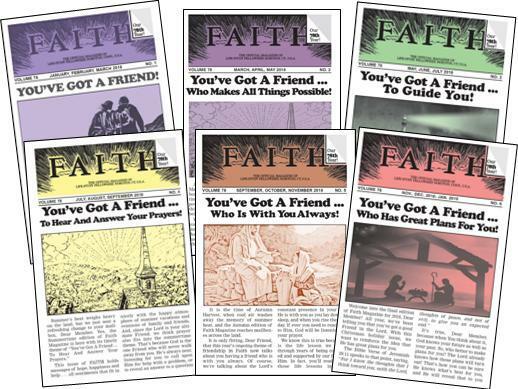 Fellowship’s bi-monthly magazine, FAITH, has been a “good friend” to its Members for more than 79 years, providing inspirational reading material based on the principles of living a prayerful life. Unlike other magazines, we do not charge a fee to subscribe to FAITH. Costs are met through the voluntary contributions of our readers. From cover to cover, there are so many wonderful things for you to read – from True Stories shared with us by FAITH readers showing how they found the answers they needed to overcome their troubles – to inspiring Poems, Helpful Household Hints, and Recipes. And what better way of sharing than by saying the Three Daily Prayers in FAITH? Each morning, noon and evening dear people near and far unite in prayer…praying for and with one another. Also in FAITH, you’ll find selected Daily Bible Verses to copy and carry with you every day for guidance and comfort. People all around the World have told us that FAITH and Life-Study Fellowship have brought more happiness and fulfillment into their lives. And we would like to extend our hand of friendship to you today. To preview our online FAITH Magazine, please CLICK HERE. To receive FAITH Magazine by mail, please CLICK HERE. To download past editions of FAITH Magazine, please CLICK HERE.